"The Indian experience of the last 120 years of a size and scope that is awesome. Sanchez is a man of tremendous vision." "Like ONE HUNDRED YEARS OF SOLITUDE, RABBIT BOSS will haunt the conscience of history forever." 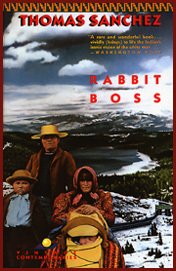 RABBIT BOSS has been hailed as a landmark work of twentieth-century American literature, a novel in which the tragic experience of the American Indian is made real and profoundly moving through the lives of four generations of a family of Washo in the California Sierra Mountains. 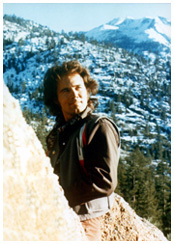 RABBIT BOSS is about the doomed hunter Gayabuc, whose first sight of the white man is his witness to the great disaster of the Donner Party in 1846, burning into the consciousness of the Washo the powerful notion that the white man is a cannibal. The time of Gayabuc's son, Captain Rex, is set against the gold and silver filled mountains of the Sierra, being plundered and stripped of their natural treasures. Hallelujah Bob, the surviving son of Captain Rex, tries to live the sacred life on the shores of Lake Tahoe, but he is isolated from his past and doomed to an alien future. For Hallelujah Bob, the Road coming is the Road going; he preaches the white man's Jesus and embraces Wovoka, the Indian Messiah, while leading the Washo to the vision of peyote. It is against a landscape of despair that Joe Birdsong inherits the once honored position of Rabbit Boss, which has been reduced to keeping the vast ranches free of rabbits. Birdsong's existence becomes a trespass against nature, the final violation of the Indian's eternal ethic, beginning his astounding flight back through time. RABBIT BOSS is panoramic and powerful-- a first novel that introduces an extraordinary young writer in an epic story about dreams dying, the loss of power, the death of flesh, the poetic triumph of a proud peoples' spirit.